The following was first published in Pastoral Liturgy (LTP). Of all the periods of catechumenal formation according to the Rite of Christian Initiation of Adults that of postbaptismal catechesis or mystagogy is usually the most difficult for ministers of Christian initiation to implement and realize (see Journey to the Fullness of Life, 39). While manyhave pointed out that mystagogical catechesis as a method should pervade each of periods of Christian initiation (see, for example, Evangelii Gaudium 166), it remains the case that this final period is crucial for the reaggregation of the newly baptized into the assembly of the faithful. In this article I outline both a rationale for and a layout of how we implemented a post-baptismal catechesis or mystagogy during the Octave of Easter. The RCIA specifies that the newly baptized should be “introduced into a fuller and more effective understanding of mysteries through the Gospel message they have learned and above all through the experience of the sacraments they have received” (RCIA 245). The newly baptized thus come, through sharing their story of faith, to give testimony to the conversion brought about in them and, by articulating their stories of initiation as part of the ongoing story of salvation, understand more fully and effectively themselves as witnesses to the saving power of Jesus Christ. Like the disciples who gathered in the upper room after the good news of the resurrection is proclaimed to them (Luke 24:33-48), the newly baptized “have truly been renewed in mind, tasted more deeply the sweetness of God’s word, received the fellowship of the Holy Spirit, and grown to know the goodness of the Lord” (RCIA 245). For this experience to bear rich fruit in the assembly of the faithful and the lives of the newly initiated alike it must be shared and nurtured. For “out of this experience, which belongs to Christians and increases as it is lived, the [newly baptized] derive a new perception of the faith, of the Church, and of the world” (RCIA 245). The principal locus of the period of mystagogy is envisioned by the RCIA to take place at “the Sunday Masses of the Easter season” (RCIA 247) in which the community’s gaze and prayers continue to be directed upon the newly baptized (RCIA 248) who are the subject of weekly preaching. An excellent resource for such is given in Cronin’s Encountering the Mystery of God: A Framework for Mystagogy from Easter to Pentecost (Mosaic, 2013). Like many other ministers of Christian initiation, however, I found it difficult to maintain such a whole-community focus on the newly baptized at a given Mass time for seven weeks in the midst of the myriad celebrations that also mark this season of resurrection in parish life including the baptism of infants, the celebration of the Rite of Reception into the full communion of the Catholic Church, and the consummation of initiation by the many receiving their first Holy Communion and Confirmation, as well as Mothers’ Day, baccalaureate, and other blessings. Like many catechumenate directors I had struggled to convince the newly baptized to meet for some form of post-baptismal catechesis apart from Mass and received ‘rates of return’ that had me sharing in Jesus’ own wonderment (Luke 17:17). I began therefore to look into the patristic models of mystagogy and discovered in the Octave of Easter an ideal framework for this period of Christian Initiation. The Octave of Easter is a solemnity and takes precedence over all but the Paschal Triduum itself (see Roman Missal, Universal Norms on the Liturgical Year, 24 and Table of Liturgical Days, 2) thus extending the Easter celebration as single eight-day event, an opportunity for the Church to probe the depths of the mystery unveiled at the Great Easter Vigil, to feel the wounded side of Christ and return to the places where life conquered death, and to resound loudly the glorious note of resurrection throughout the week. This stretching out of the week, wherein the Easter season is a week of weeks (7 x 7), is particularly evident in the liturgical observance of the Octave of Easter in the Divine Office wherein the “Hymn, antiphons, psalms and canticle [are] as on Easter Sunday” (Liturgy of the Hours). While a parish might ideally gather the newly baptized together with the faithful for the celebration of the Liturgy of the Eucharist each weekday of the Octave the timing proved difficult in practice for our parish. In order to accommodate both the needs of the newly baptized and that of the wider community special solemn celebrations of Evening Prayer were therefore arranged for each evening of the Octave of Easter, beginning with Easter Sunday Vespers through to Evening Prayer on the Second Sunday of Easter. Each evening, by ritually sounding again and again the same glorious tone of our Easter Sunday of the Resurrection, the newly baptized gathered together with the faithful who were invited to join in “an eight-day retreat, exploring the primary symbols of the Paschal Triduum to probe the depths of our Christian life,” diving deeper into those mysteries in which the newly baptized have come to participate. Construed therefore as an ‘Easter mission,’ this annual occurrence of ‘Going an Octave Deeper’ invited the faithful to not only renew their own commitment to their Christian initiation but also invited them to develop even closer ties and greater intimacy with those who had been newly initiated into Christ (RCIA 246) in whose zeal all might come to share. Though beginning each evening with an identical solemn celebration of Easter Vespers (apart from the variable short reading) we desired also to shine a spotlight as it were on the different aspects of the Paschal Mystery into which the newly baptized have been immersed just days before. We found the inspiration for doing so by again turning to the Octave of Easter as that time when many of the finest examples of mystagogical preaching found in the patristic literature were both first delivered to the newly baptized in the early centuries of the Church (see Yarnold’s The Awe-Inspiring Rites of Christian Initiation and Harmless’ Augustine and the Catechumenate, 300-345). These treasures are still opened to the faithful during the Octave of Easter in our age specifically in the second readings of the Office of Readings. Each evening when we gathered, following solemn Vespers, we would process to the baptismal font and, around a single symbol for that evening, invite the newly baptized to share their experience of participating in the Paschal Mystery of Christ (the invisible, the thing signified) by starting with their privileged vantage of the nearness of participating in the sacraments (the visible, the sign, see CCC 1075). To facilitate this “probing the rites of initiation, their gestures, symbols, and words in terms of their biblical foundation and essential role in Christian living” (Satterlee, Ambrose of Milan’s Method of Mystagogical Preaching, 6) one principal symbol was chosen for each evening as noted below. A brief introduction to the Octave of Easter, an explanation of mystagogical catechesis and some examples of the typological or figurative hermeneutic laid the groundwork for the neophytes to see that in their very selves the action of salvation has taken place and, that in continuing to bring about their sanctification through admission to the sacramental life, Christ has made them loci of salvation not only for themselves but also for the community at large. As we read in the second reading for the Office of Readings on Monday of the Octave of Easter “the type has passed away; the reality has come” (Bishop Melito of Sardis). Through sharing their stories of conversion with the intimate assembly gathered with them around the font where these neophytes were reborn the night before reveal the ongoing reality of the presence of Christ. This served as an invitation for the newly initiated to share what they experienced in the celebration of initiation. We concluded with what we took as the symbol that evening, an embrace of peace as a sign of Easter joy and our common bond as the baptized. Using fire as a primary religious symbol the stories of Moses encountering God in the burning bush, Elijah calling down fire on Mount Carmel, and the Israelites following the pillar of fire were all given as types of the Paschal Candle, the transformative yet threatening power of the Holy Spirit as flame now handed onto the newly baptized. After inviting those present to share how they had been transformed by their encounter with Christ and how they felt called to hand on that faith to others, all were given an unlit candle by means of which they received the light of Christ from a taper lit from the Paschal Candle which they in turn handed on as we sang the “Alleluia” acclamation that was sung following their baptism two days before. Water is the central symbol of the Easter Vigil, the very same water that flowed from the side of Christ, the fulfillment of the new temple foreseen by Ezekiel, both as a healing and refreshing fountain of life as well as a dangerous and death-dealing force. Our conversation began with these reflections on fire and the second reading from the Office of Readings for Thursday of the Octave of Easter. “You were lead down to the font of holy baptism just as Christ was taken down from the cross…You made the profession of faith that brings salvation, you were plunged into the water, and three times you rose again.” (Jerusalem Catecheses). The newly baptized were invited to share with all present how the experience of their baptism fulfilled in them the salvation foreshadowed in sacred scripture. One at a time they approached the baptismal font and made the Sign of the Cross with a profound gesture as we sang the Vidi Aquam used at the Easter Vigil sprinkling rite. The wood of the Cross, the same large Cross used for the Good Friday celebration of the Passion of the Lord, was placed near the baptismal font and typologies, such as seeing the Cross as the new Tree of Life, the throne of Christ’s glory, the fulfillment of the incarnation foreshadowed in the crèche, the true pole of the earth, the taunt of empire, and as shady refuge of the eschaton to come (see Micah 4:4) were all laid before those present who were invited to share the burdens they had to bear in their conversion to Christ. All of those present were then invited to touch once again the Cross as a few verses from the Good Friday hymn “Faithful Cross” were sung. The ambry adjacent to the baptismal font was opened and a light illumined the Sacred Chrism. The image of oil as penetrating, powerful, healing, and transformative agent made from the crushed flesh of the olive to give strength to others formed the basis of this evening’s conversation. We invited the neophytes to share how “we became ‘the anointed ones’ when we received the sign of the Holy Spirit. Indeed everything took place in us by means of images, because we ourselves are images of Christ” (Jerusalem Catecheses, from the second reading of the Office of Readings for Friday of the Octave of Easter). Those neophytes who joined us one week before the Chrism Mass shared their experience and sections of the prayer for Consecration of the Sacred Chrism and the hymn “O Redeemer” were shared. The oil, infused with the sweet aroma of Christ by the pneuma of the Holy Spirit, which is used to anoint as priest, prophet, and king was indicated as itself a type as David was a type of the Christ/anointed one to whom we are conformed in Christian initiation and likewise bear witness in fragrant reality. All were invited to waft toward their face the scent coming from the opened jar of Sacred Chrism that they might smell the sweet aroma during which the Veni, Sancte Spiritus as used during the anointing with Chrism at the Easter Vigil. An empty chalice was placed on a red pall on the baptismal font. Images of blood revealing how blood is the symbol of life and death, reserved to God, serves to seal a covenant, and is that which is poured out in sacrifice for others so that they might also have life formed the basis for inviting the neophytes to share how their conversion had lead them to live for others. Echoing the cost of becoming disciples of Jesus Christ shared on Wednesday this evening, one week after Good Friday, lead them to understand more deeply how their conversion was something given them now for the building up of others. In conclusion the empty chalice was passed from person for each to gaze upon as the antiphon used during the Washing of the Feet on Holy Thursday was sung. The Gospel book, opened to the illuminated page of the Easter Sunday Gospel, was placed on a stand near the baptismal font. A brazier of incense was placed at the foot of the stand. The image of the Word, Jesus as the Word incarnate, was opened to the neophytes. They were invited to share how the sacred scripture had formed them in their faith, how they see themselves living into sacred Scripture, and how “their new participation in the sacraments enlightens [their] understanding of the Scriptures” (RCIA 246). In conclusion, as incense was placed in the brazier, all present came one at a time to the Gospel book in order to make some sign of veneration to the open book. All of the neophytes, most of whom have gathered each evening for the last seven evenings since their rebirth in the waters of baptism, now attend the celebration of the Sunday Eucharist together. Each wears the white alb with which she was clothed at her baptism. This Second Sunday of Easter, long known as Quasimodo Sunday from the proper Introit, “Quasi modo geniti infantes…” rendered now as the Entrance Antiphon, “Like newborn infants, you must long for the pure, spiritual milk, that in him you may grow to salvation, alleluia” (1 Peter 2:2), invites a focus on these newborns in Christ. The homily also spoke not only to the newly baptized, echoing the words St. Augustine spoke to the neophytes in Hippo, “I speak to you who have been reborn in baptism, my little children in Christ, you who are the new offspring of the Church, gift of the Father, proof of Mother Church’s fruitfulness…the very flower of our ministry and the fruit of our toil” (second reading from the Office of Readings for the Second Sunday of Easter), but also to all those nourished together at the supper of the lamb who, as missionary disciples, see the fruit of their own testimony blossom in those reborn in their midst. Together these newly initiated, our children in faith, also returned to God the gifts of bread and wine they received in the presentation of the gifts. That evening the neophytes and those members of the assembly who have joined them for this eight-day Easter mission, “Going an Octave Deeper,” gathered for a final time for solemn Vespers then processed to the baptismal font. The pervading image we used this evening was that of bread. The image of Torah as bread, the manifold types of Eucharist found in the Old Testament (see the first readings appointed for the Seventeenth through Twentieth Sundays of Ordinary Time, cycle B in the Lectionary for Mass), the image of bread formed from crushed grains bound together in water and fired into a single loaf, the Eucharist prefigured in the Passover and instituted at the Last Supper, given in the post-resurrection appearances, and awaited in the eschatological banquet to come were all explicated as an invitation for the newly baptized to deepen their understanding of into whom they have been reborn. As St. Augustine writes in his Sermon for this day and which the church appoints for the second reading of the Office of Reading, “Today is fulfilled in you the sign of faith that was prefigured in the Old Testament by the circumcision of the flesh on the eight day after birth…you have received the sacrament or sign of this reality.” The newly baptized have been incorporated into the Body of Christ which they receive, presenting themselves as humble gifts, overshadowed by the power of the Holy Spirit, and now sent into the world to be witnesses to holiness. We conclude this Second Sunday of Easter and the whole “Going an Octave Deeper” by having the newly baptized take off their albs and place them at the foot of the sanctuary, while we sang Psalm 118, the Communion for Easter Sunday. This Second Sunday of Easter was known in the preconciliar Missal as Dominica in albis depositis, namely the Sunday for giving up or depositing those white albs the neophytes presumably wore during the whole Octave of Easter. These individual grains have, by removing their albs, taken off their distinctive garb, their husk as it were, and are now are sifted into the assembly of the faithful, a leaven full of zeal and new life in the one Body, the Church. Though not initially designed for to prepare candidates for reception into the full communion of the Catholic Church “Going an Octave Deeper” also served as a great retreat for those who men and women already baptized to “receive doctrinal and spiritual preparation…to deepen an inner adherence to the Church, where [they] will find the fullness of [their] baptism (RCIA 477). For these men and women the proximity of the immersion into the sacramental life may have been more distant; however, by joining with the faithful in renewing their baptism at the Easter Vigil and reflecting on their own baptismal covenant during this Octave of Easter they were awakened to the profundity of their own baptism in a process of anamnesis in advance of being subsequently received into the full communion of the Catholic Church, confirmed, and admitted to Holy Communion (see National Statutes for the Catechumenate 32-33). It is my hope that this experience we had with a successful post-baptismal catechesis or mystagogy situated within solemn celebrations of Evening Prayer during the Octave of Easter will lead other ministers of Christian initiation to reclaim these and many more treasures of the church and, through mystagogical or liturgical catechesis, lead those who have been reborn to their full stature in Christ. And may the “God of everlasting mercy, who in the very recurrence of the paschal feast kindle the faith of the people you have made your own, increase, we pray, the grace you have bestowed, that all may grasp and rightly understand in what font they have been washed, by whose Spirit they have been reborn, by whose Blood they have been redeemed. Through our Lord Jesus Christ, your Son, who lives and reigns with you in the unity of the Holy Spirit, one God, for ever and ever” (Roman Missal, Collect for the Second Sunday of Easter). Encountering the Mystery of God: A Framework for Mystagogy from Easter to Pentecost, Patrick J. Cronin, cfc (Mosaic, 2013). Augustine and the Catechumenate, William Harmless, sj (Pueblo, 1995). Ambrose of Milan’s Method of Mystagogical Preaching, Craig A. Satterlee (Pueblo, 2002). The Awe-Inspiring Rites of Christian Initiation: The Origins of the R.C.I.A., Edward Yarnold, sj (Liturgical Press, 1994). …the neophytes, most of whom have gathered each evening for the last seven evenings since their rebirth in the waters of baptism, now attend the celebration of the Sunday Eucharist together. Each wears the white alb with which she was clothed at her baptism. This Second Sunday of Easter, long known as Quasimodo Sunday from the proper Introit, “Quasi modo geniti infantes…” rendered now as the Entrance Antiphon, “Like newborn infants, you must long for the pure, spiritual milk, that in him you may grow to salvation, alleluia” (1 Peter 2:2), invites a focus on these newborns in Christ. The homily this day speaks not only to the newly baptized, echoing the words St. Augustine spoke to the neophytes in Hippo, “I speak to you who have been reborn in baptism, my little children in Christ, you who are the new offspring of the Church, gift of the Father, proof of Mother Church’s fruitfulness…the very flower of our ministry and the fruit of our toil” (second reading from the Office of Readings for the Second Sunday of Easter), but also to all those nourished together at the supper of the Lamb who, as missionary disciples, see the fruit of their own testimony blossom in those reborn in their midst. Together these newly initiated, our children in faith, will now also return to God the gifts of bread and wine they received through their participation in the presentation of the gifts. This evening the neophytes and those members of the assembly who have joined them for our eight-day Easter mission, “Going an Octave Deeper,” gather for a final time for solemn Vespers then process to the baptismal font. The pervading image we use this evening is that of bread. The image of Torah as bread, the manifold types of Eucharist found in the Old Testament (see the first readings appointed for the Seventeenth through Twentieth Sundays of Ordinary Time, cycle B in the Lectionary for Mass), the image of bread formed from crushed grains bound together in water and fired into a single loaf, the Eucharist prefigured in the Passover and instituted at the Last Supper, given in the post-resurrection appearances, and awaited in the eschatological banquet to come are all explicated as an invitation for the newly baptized to deepen their understanding of into whom they have been reborn. As St. Augustine writes in his Sermon for this day and which the Church appoints for the second reading of the Office of Reading, “Today is fulfilled in you the sign of faith that was prefigured in the Old Testament by the circumcision of the flesh on the eighth day after birth…you have received the sacrament or sign of this reality.” The newly baptized have been incorporated into the Body of Christ which they receive, presenting themselves as humble gifts, overshadowed by the power of the Holy Spirit, and now sent into the world to be witnesses to holiness. We conclude this Second Sunday of Easter and the whole “Going an Octave Deeper” by having the newly baptized take off their albs and place them at the foot of the sanctuary, while we sing Psalm 118, the Communion for Easter Sunday. This Second Sunday of Easter was known in the preconciliar Missal as Dominica in albis depositis, namely the Sunday for giving up or depositing those white albs the neophytes presumably wore during the whole Octave of Easter in the early Church. These individual grains have, by removing their albs, taken off their distinctive garb, their husk as it were, and are now are sifted into the assembly of the faithful, a leaven full of zeal and new life in the one Body, the Church. And may the “God of everlasting mercy, who in the very recurrence of the paschal feast kindle the faith of the people you have made your own, increase, we pray, the grace…bestowed, that all may grasp and rightly understand in what font they have been washed, by whose Spirit they have been reborn, by whose Blood they have been redeemed. Through our Lord Jesus Christ, your Son, who lives and reigns with you in the unity of the Holy Spirit, one God, for ever and ever” (Roman Missal, Collect for the Second Sunday of Easter). a liturgical framework for post-baptismal catechesis or mystagogy in the implementation of the Rite of Christian Initiation of Adults,” published in the March/April 2016 issue of Pastoral Liturgy (LTP). Yesterday I had the pleasure of presenting about the Liturgy of the Hours for the monthly recollection at the Carmelite Institute of Spirituality in Stanwood. Yesterday, March 19, was also the solemnity of Saint Joseph, spouse of the Blessed Virgin Mary and, as the adoptive father of Jesus the Christ, the day is something of the Catholic equivalent of Fathers’ Day. It was an appropriate day to be with the Carmelite community given that the founder of the Discalced Carmelites, St. Teresa of Avila, advocated a special devotion to St. Joseph. The (in)famous tradition of burying a statue of St. Joseph even stems therefrom as Teresa is reputed to have buried a statue of St. Joseph on the ground she had chosen for her new Carmel and, once the land was donated to the nascent order, she had a chapel to St. Joseph erected on the exact location. During yesterday’s morning celebration of the Liturgy of the Eucharist to open the day of recollection I was struck by an insight shared by Fr. James Zakowicz, OCD in his homily. We often hear that Saint Joseph was silent as no known words of sacred scripture are attributed to this carpenter from Nazareth. Yet his very name means, “to bring increase,” like his Old Testament type, this beloved son of Israel increases the house of Israel by his own going down. As we heard yesterday, though, it is not quite true that we have no recorded words of Saint Joseph. We learn from the Gospel of the day that Joseph is entrusted by the angel with the naming the son of his betrothed, Mary (Matthew 1:21). Joseph alone is therefore the first to speak the name “Jesus,” meaning “YHWH helps,” not only giving the Lord his name but also claiming Jesus as his own, naming the child as a member of his own household of the line of David, and therefore declaring that from Israel, as God promised, that “God saves!” So was Joseph silent? Hardly. In fact he had already spoken the only word, the one word, the name (itself echoing the Old Testament type of the son of Nun) by which victory is won and the walls of the enemy, death, are laid low. Therefore nothing else more need be or could be said. The ineffable had been given a name, something which only could be known by revelation (like Moses’ encounter with YHWH on Mt Sinai/Horeb), and therefore the only response is to fall silent before such a profound mystery as the incarnation. Today, coincidentally, marked the celebration of Palm Sunday of the Passion of the Lord during which we heard as our second reading that central reading from Philippians (2:9-10), wherein Saint Paul tells us it was God the Father who “bestowed on [the Son] the name which is above every name…Jesus!” So Joseph’s fatherhood of Jesus is not merely functional—taking care of Mary’s child though this is certainly something Joseph did—but a true fatherhood, imparting Jesus’ identity by making known in a public way what had laid hidden since the foundations of the world. Joseph’s fatherhood is therefore a true participation in that divine fatherhood from whom Jesus is born. By naming Jesus Joseph prefigured the saving efficacy of Jesus’ life, death, and resurrection. The unfolding of this Paschal Mystery began, as we remember in today’s liturgy, with Jesus’ triumphant entry in Jerusalem. Jesus, meek and humble like his father, as he stood on the cusp of being born to eternal life, rode into his glory, that is to give glory to his Father, on a donkey this time in a public way into this heavenly father’s city. Three decades before, on the cusp of being born (that is making the word-become-flesh known to the world), Jesus rode a donkey privately, almost clandestinely, as Joseph lead him into Bethlehem, his earthly father’s ancestral town. Saint Joseph was not silent but simply declared by that only word known to be spoken by him, “Jesus,” to be a father to our Lord Jesus Christ, a true father and true spouse. St Joseph, patron of fathers, pray for us! A blessed Holy Week and sacred Paschal Triduum to all! Today’s feast of the Presentation of the Lord (February 2), alternatively known as Candlemas or the feast of the Meeting of the Lord, has come for me to be about new beginnings. It also seems to be an occasion for writing blog posts as in 2014 I remarked on the occurrence of the feast on a Sunday and in 2006 I wrote about celebrating the feast as a first-time liturgist. Today at the chancery I had the great blessing of being part of a meeting of parish and archdiocesan leaders using Alpha to form missionary disciples in Catholic parishes. We discussed our experiences and planned future archdiocesan support of Alpha, collaboration between parishes, and followup efforts to foster the new evangelization. Attendees at our meeting included Fr. Jim Lee, pastor of St. Michael in Olympia where Alpha is being used very effectively to bring people to encounter Christ, and Deacon Steve Mitchell, National Director of Alpha in a Catholic Context. Therefore this liturgist whipped together a Mass for the occasion complete with our chancery a cappella choir to lead us in singing the dialogues and proper antiphons to accompany the lighting and blessing of the candles and subsequent procession through the chancery hallway. Deacon Steven preached eloquently of this feast of the Presentation of the Lord as the celebration of and invitation to evangelization (see Joy of the Gospel 24) referring to the lighting of the candles as an incarnation of the act of handing on the faith. Through the infusion of the Holy Spirit in the chapel and aided by the vigorous and conscious participation of all therein and Fr. Jim’s careful pacing, we were made palpably aware of the missionary dimension of this feast of the Presentation of the Lord where “we, too, go forth, rejoicing to encounter [Christ’s] Salvation” (Preface), taking a front seat in facilitating others’ awakening to Christ in our ministry on Alpha. The rest of the day was a beautiful reminder of the work of evangelization going on in parishes and an opportunity to share with others how my home parish of St. John Vianney accepted the invitation to pilot Alpha in order to not only evangelize our own but also to form us as intentional, missional disciples who understand our parish as that territory of Vashon-Maury Island entrusted to the stewardship of our pastor who has care for all of the more than 10,000 souls that call this home and all those who visit here and not exclusively those in the pews and on the registers. As members of the assembly, that is to say those of us who have encountered Christ in and through the sacred liturgy, we are made coworkers with our pastors in reaping this harvest, sharing with others the good news, and inviting our friends and neighbors to meet Christ. This feast of the Presentation of the Lord reminds us and equips us to “Go out and meet Christ.” Alpha we found offers a simple method to awaken the gift of the Holy Spirit poured out on us in full in baptism so that we can go forth and announce the good news. So, once again, ten years since I first fell in love with the feast of the Presentation of the Lord as a liturgist, I am falling in love with this liturgical Meeting of the Lord all over again—as an evangelist. “A light of revelation to the Gentiles…prepared in the sight of all peoples” is entrusted to each of us who, like Simeon, have had the joy and spiritual consolation of meeting our Lord. How will you, enlightened by the same Spirit, confess him with exultation, and hand on that flame of faith? Yesterday morning, the Second Sunday of Ordinary Time, we heard proclaimed from John’s Gospel the third part of the great theophany triptych—the epiphany, the baptism, and the fist sign—namely the account of the wedding feast at Cana. 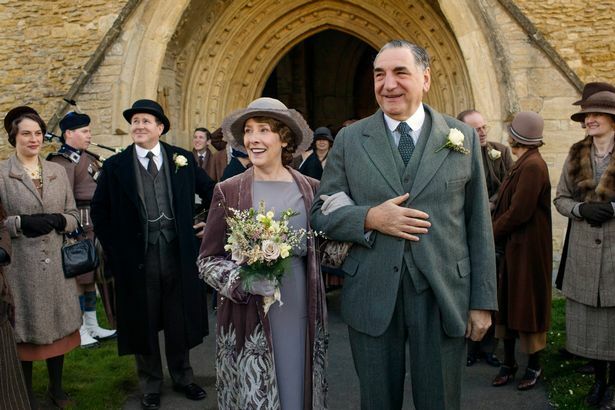 And last night we joined millions in watching the wedding of Mr. Carson and Ms. née Hughes of Downton Abbey. I was struck by a great many similarities in these stories and it is not merely in that both were nuptial celebrations. I have often used the story of the wedding feast of Cana to open formation events with liturgical ministers pointing out to them that it was the servants, not the others, who knew from whence the wine-transformed-from-water had come. While all feasted on the glorious banquet it was only to those who had humbly done as the Lord invited them that his glory was revealed. With liturgical ministers I always try to help them connect this with their own experience of assisting at the sacred liturgy where, profoundly aware of our own ordinariness we have been, through no great accomplishment which we can claim, be invited and elevated to serve as a servant of the Lord. Like the water, a sign of the human, we are turned toward divinity, our true telos. It was not by accident that John has the servants draw the water from the enormous ceremonial ablution basins (“jars for washing”). This great moment of revealing Jesus’ identity prepares us for the mercy of God which is made known through our own quotidian sinfulness. As the servants dipped into those waters by which is signified our need for purification they see it redeemed and transformed, made the best of wine because it has been humbled and in turn glorified. And this was his first sign. As I watched Mr. and Mrs. Carson prepare for and celebrate their marriage in the Downton School House it struck me that the glory of Downton was most revealed there, outside of the great house, in this public space by these humble servants. There a man and woman, both dignified in their life of service, entering into a union unsullied by those oft-failed unions of the great house—which albeit make the show so interesting to watch. Purified as it were of their entanglements each was washed clean of their respective sense of unworthiness to live their own full life, binding them a little too close to the house. Mr. and Mrs. Carson, ironically as the servants, thus reveal the greatest nobility of the house. These servants are honored as the nobles enter their life rather than is so often portrayed the other way around. The surprise return of the former chauffeur, Tom Branson, who enters now as a member of the household to which he seeks readmission (are we now in Luke 15? ), seems to confirm this as the joy of the wedding banquet is both increased and yet shifted off in some measure from the Carsons’ union to encompass all. It is not of course a perfect parallel but I found some interesting similarities between the revelation of Christ through the obedience of the servants as this denouement season of the Downton Abbey series portending the future glory of the great house through the servants, all too cognizant of their own simplicity, being themselves elevated and showing the true glory of the Downton Abbey with which so many are captivated. What do you think? Are there really any similarities? It is, therefore, perhaps not so peculiar after all to mark the Dedication of the Lateran Basilica in Rome as part of the sanctoral (calendar of the saints) as the church is personified. As we prepare for the dedication of a new church here in the Archdiocese of Seattle, at Immaculate Conception in Mount Vernon, which we will celebrate this Wednesday evening at 7:00pm, it is fitting that today’s feast invites us to recall and prepare for the significant act of dedicating a church building. In this solemn rite the walls are sprinkled, like a Christian washed pure in baptism, set aside for exclusive use as a locus of public worship. The head of the church, that is the altar, directly upon which is burned a heap of incense, is subsequently anointed with sacred chrism, sealing the altar as the Christian is sealed at confirmation. The walls are similarly anointed in twelve (or four) places which ordinarily are further marked by candles lit not only on this day but also on the anniversary of dedication analogous to those candles given as part of the explanatory rites at baptism. Finally, in order to consummate the Rite of Dedication of a Church the bishop presides at the celebration of the Liturgy of the Eucharist upon the altar thus consecrating it, hallowing it for such eucharistic celebrations alone. So also is this the telos, the destiny, of all Christians likewise oriented toward union with God in the Son who gives himself to us through the action of the Holy Spirit by which the risen Christ is incarnate for us in the bread eaten and wine imbibed—our source and summit as Christians. Additional elements of the Rite of Dedication of a Church (may) include the handing over of a new church to the (arch)bishop by the builders or parishioners, the placement of relics in the sanctuary, and the first reposition of the Blessed Sacrament within the virginal tabernacle. All of these further show forth how the church building is a sacrament of the Church, a revelation in stone and wood, in well-ordered space, signifying and effecting God entering into human life, human history, space, and time in order to not only make known divine love but also to bring that love to fruition in our salvation, our sanctification. the born-but-once unknown by felicity. that swallows age and spits out youth. for those born here are holy! Yesterday at Mass we heard in the Gospel how those who thronged along the beach around Jesus “were like sheep without a shepherd” and how, in fulfillment of the First Reading from Jeremiah, the promise of the Lord to “appoint shepherds for them who will shepherd them” takes flesh in the very person of Jesus who, “moved with pity for them…began to teach them many things” (Mark 6:34). This set of readings which the Lectionary appoints for the Sixteenth Sunday in Ordinary Time (Cycle B) not only presents its own occasion for exegesis but also sets the stage for the next five Sundays (July 26, August 2, 9, 16, and 23). Owing to the short length of the Gospel of Mark from which we have been hearing during this Cycle B of the liturgical year when compared with the other two synoptic Gospels (Matthew and Luke, assigned to Cycles A and C respectively) the next five Sundays of the Lectionary substitute the Gospel of John’s account of the multiplication of loaves and fishes (6:1-15) for the parallel event in the Gospel of Mark (6:35-44) on the coming Seventeenth Sunday in Ordinary Time (B) and then expands to fill the subsequent four Sundays with the shepherd’s teaching from the Gospel of John’s lengthy Bread of Life Discourse (John 6:22-69) as Jesus himself teaches his flock what the miraculous multiplication means. On each of these five Sundays the Lectionary pairs richly typological First Readings with the Gospel, each prefiguring the Eucharist as the Real Presence of Christ who remains sacramentally with us. This five Sunday sequence presents preachers and catechists alike a wonderful opportunity to help lead the flock of the faithful to encounter Christ anew in the Bread of Life, that celebration of the Liturgy of the Eucharist, those mysteries into which the resurrected Christ has passed over. On the heels of facilitating an online course on Liturgical Theology by Dr. Fagerberg during which I happily read for the umpteenth time What Happens At Mass by Fr. Jeremy Driscoll which I have used extensively for liturgical catechesis (see CCC 1074ff.) it occurred to me how frequently we participate in the Mass only bodily and miss the depths to which Christ goes in order to invite us to encounter his saving love therein. Would that the shepherds of souls whom the Lord sends to teach would realize and be equipped to “ensure that the faithful take part [in the sacred liturgy] fully aware of what they are doing, actively engaged in the rite, and enriched by its effects” (Sacrosanctum Concilium 11). A comprehensive program, Believe Celebrate Live developed by the liturgical staff of St James Cathedral, offers a five week study for parishes that would, together with other great resources already mentioned as well as some additional ones below, could profitably be used for parish catechesis. In order to bring “all the faithful…to that fully conscious, and active participation in liturgical celebrations which is demanded by the very nature of the liturgy…their right and duty by reason of their baptism…the primary and indispensable source from which the faithful are to derive the true Christian spirit” I had occasion to coach our Liturgy Office intern, Julianna Castro, as she developed a script for a Commentator to use during the Liturgy of the Eucharist, offering prepared reflections before the Mass and at other appropriate times indicated in the Order of Mass, meant to assist pastors in bringing about “this full and active participation by all the people” (Sacrosanctum Concilium 14). I’m happy to share with you these Commentator scripts and example intercessions as an example and welcome your insights on additional resources you have found fruitful. If you are so inclined to use these Commentator scripts (or a similar form of Mass catechesis) in your parish, faith community, or domestic church over the coming weeks during which the Church unfolds the mystery of the Eucharist in an explicit way please do share your experiences with such. May we who are nourished by the Bread of Life “taste and see the goodness of the Lord” (Ps 34:9) who opens his hands to feed us (Ps 145:16) with the bread come down from heaven (Ps 78:24) so that he might make us sharers in him in whose Body and Blood we have Communion.